Zplay’s Bump Hero is an addicting endless “hopper” that lets you move your hero along a very difficult blocky path. Your goal is to keep hopping without falling off the path and bumping as many creatures as you can. Every time you hit a creature, you earn a point. Beating your previous high score can be quite challenging in this fast-paced hopper, as you will have to quickly move from one block to another and catch agile animals to score more points and earn coins scattered all around the blocky path. With the help of these quick tips, hints and tricks, you will be able to know how to survive the winding road and reach a high score. Noticed the golden bar at the top of the screen, just below your score? Well, it keeps decreasing and decreases quite rapidly if your hero stops or slowly hops from one tile to another. If the golden bar turns red and reaches the end, it’s game over. You should tap rapidly to make him move faster. The quicker he hops from one tile to the other, the faster the golden bar fills up. The bar also increases slightly when you bump into a creature. So keep hopping and dashing into creatures and the golden bar will never turn red. When you see a straight path, don’t miss the opportunity to hop faster. 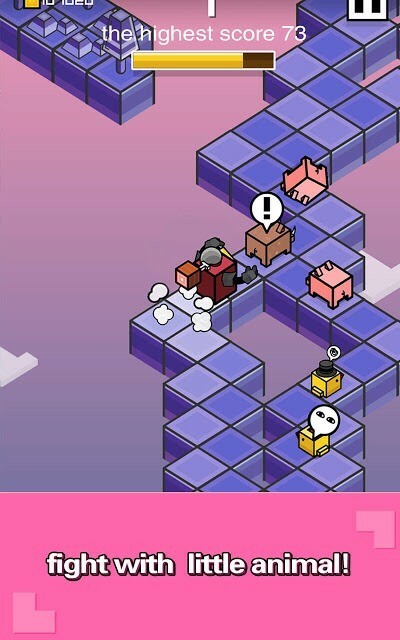 You will get slower when your hero moves along a path that has plenty of bends and curves, but once you see a straight path, tap rapidly to hop from one tile to another to boost the golden bar. The Fever Mode gets triggered when the golden bar is full. That’s when more creatures appear on the screen. When it gets triggered, keep hopping and hitting creatures to keep the fever mode on for a longer period of time. To enter Fever Mode frequently, you should tap left and right side of the screen faster to make your hero quickly hop from one tile to another. Do remember that the golden bar fills up faster if the hero moves faster and not because he hits creatures. Don’t ignore them. Choose a path containing the coin and collect it. Collect as many coins as possible so that later you can use them to revive your hero. When your hero dies by falling off from the path (or because the golden bar becomes empty), you have the option to revive him so that you can continue your adventure from where you left. Initially, you will spend only 2 coins to revive your hero, but later the coins required will be 4, 8, 16 and so on. Try to use the revive option when the game ends, you have a great good score and would want to continue from where you left. Smaller creatures usually hop faster and it becomes very difficult to catch them. Don’t just go after them blindly or your hero may fall off the path. They will keep coming and new species of animals will arrive once you have hit all animals of one species. Just make sure you don’t stop or move slow. If you do that, then the golden bar will decrease faster.